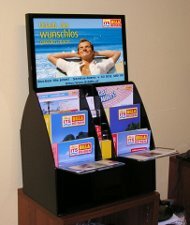 Multimedia folder dispensers by Ecom4 offer future-oriented information transmission in combination with typical information media. 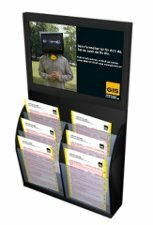 Video displays with sound present slideshows of current products, image videos or exhibition highlights while the dispenser contains newest catalogues or folders which can be picked up by customers. Ecom4's multimedia folder dispensers are available as stationary or as portable unit and they offer up to 12 storage spaces and display sizes from 7" to 22". Stationary types use platforms on castors and can be moved quickly and easily. Corporate colors or special designs are available. 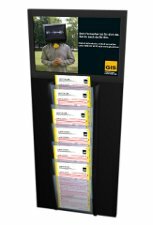 A multimedia folder dispenser for the usage in a foyer, on a counter or on a desk, contains 6 A4 storage spaces, 3 small storage spaces for business cards or promotional items and 2 slip-on trays for presentation of small components. 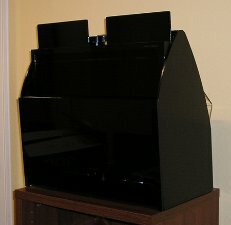 22" multimedia display for video, slideshow, sound; automatic endless loup, infrared remote control. For transportation, the display is detached and put in a padded case on the back side. 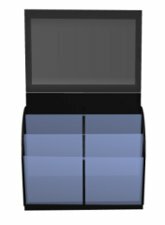 A multimedia folder dispenser that contains 6 A4 storage spaces, an A4 folding frame in the base area, a 10" multimedia display for video, slideshow and sound; automatic endless loop, infrared remote control; fixable rollers, tray on the back side for catalogues or folders. Like M2 PD 6/10, but contains 12 A4 storage spaces and a 22" multimedia display. 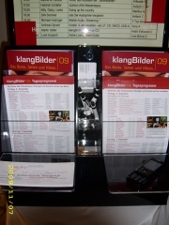 A multimedia folder dispenser for desk or counter, with 3 A4 storage spaces, 8" multimedia display for video, slideshow and sound; automatic endless loop, infrared remote control. 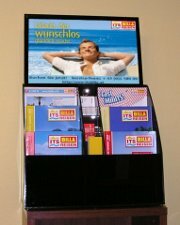 A multimedia folder dispenser for wall mounting, with 6 A4 storage spaces, 22" multimedia display for video, slideshow and sound; automatic endless loop, infrared remote control. 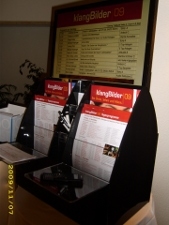 A multimedia folder dispenser for wall mounting, with 2x3 A4 storage spaces, 56cm multimedia display for video, slideshow and sound; automatic endless loop, infrared remote control. 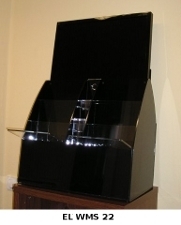 A multimedia folder dispenser for wall mounting, with 12 A4 storage spaces, 56cm multimedia display for video, slideshow and sound; automatic endless loop, infrared remote control.